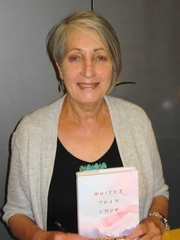 Sandra Dallas, author of Whiter Than Snow, The Persian Pickle Club, etc., in Phoenix. Sandra Dallas will sign and discuss Fallen Women (St. Martin's Press; $25.99). Sandra Dallas -- "Fallen Women"
Sandra Dallas will speak about and sign her new book, Fallen Women, on Friday, October 25th at 7:30pm. About the Book: From the mansions of Denver's wealthy to the seamy life of desperate women, Fallen Women illuminates the darkest places of the human heart. In 1885, New York socialite Beret Osmundsen has been estranged from her sister, Lillie, when she gets word that Lillie had become a prostitute and was murdered. Beret makes her way to Denver, determined to find her sister's murderer. Sandra Dallas delivers a page-turner filled with mystery, intrigue, and the kind of intricate detail that transports you to another time and place. Colorado author Sandra Dallas will be the featured speaker at a fund-raising event for the Eagle County Historical Society on Thursday, Sept. 27. Dallas is a New York Times best-selling author and the author of 10 novels as well as 10 nonfiction books. Most of her books involve some aspect of Colorado history. Vogue Magazine described Dallas as “A quintessential American voice.” Her most recent novel, “True Sisters,” was listed on the New York Times Best Seller list the week of its debute. Sandra Dallas, New York Times best-selling author, is a journalism graduate of the University of Denver. She began her writing career as a reporter with Business Week. A staff member for twenty-five years (and the magazine’s first female bureau chief,) she covered the Rocky Mountain region, writing about everything from penny-stock scandals to hard-rock mining, western energy development to contemporary polygamy. Many of her experiences have been incorporated into her novels. While a reporter, she began writing the first of her nonfiction books. They include Sacred Paint, which won the National Cowboy Hall of Fame Western Heritage Wrangler Award, and The Quilt That Walked to Golden, recipient of the Independent Publishers Assn. Benjamin Franklin Award. Turning to fiction in 1990, Sandra has published ten novels, including The Bride’s House. Sandra is the recipient of the Women Writing the West Willa Award for New Mercies, and two-time winner of the Western Writers of America Spur Award, for The Chili Queen and Tallgrass. The audio version of Tallgrass won two Audio Publishers Assn. Audie Awards. Prayers for Sale was given the Romantic Times Reviewer’s Choice Award for Historical Fiction. In addition, Sandra has been a finalist for the Colorado Book Award, the Mountain and Plains Booksellers Assn. Award, the Romantic Times Reviewers Choice Award, and a six-time finalist for the Women Writing the West Willa Award. New York Times bestselling author Sandra Dallas will read from and sign her latest book, True Sisters. Book Vault is very pleased to invite you to a special evening with Sandra Dallas. Sandra is a best-selling author of both nonfiction and fiction and her works have been translated into a dozen foreign languages and optioned for films. A native of Colorado, her books have central themes of loyalty, friendship, and human dignity. Many of her books are rooted in the experiences she had during twenty-five years as a writer for Business Week covering the Rocky Mountain region. She will be reading and speaking about her newest novel, True Sisters. Refreshments will be served. Sandra Dallas promotes True Sisters. SANDRA DALLAS reads from The Bride's House. Sandra Dallas on tour for The Bride's House. Although her novels aren't strictly a series, the characters from one book often make appearances in other novels, and so in a sense all her novels are set in the same fictitious world. Sandra Dallas's book The Bride's House was available from LibraryThing Early Reviewers. Sandra Dallas is currently considered a "single author." If one or more works are by a distinct, homonymous authors, go ahead and split the author. Sandra Dallas is composed of 2 names. You can examine and separate out names.